Boeuf Bourguignon and Julia Child. The two kind of go together, and invariably draw references to the recent movie Julie and Julia. But it doesn't have to be that way. For my purposes, I like to cook and experiment with all types of cooking and dishes, whether they are part of a movie or not. So eventually, if you cook enough, you are going to try Boeuf Bourguigon, as well as other French classics like Coq Au Vin (as prepared by Christina in Budapest). In my case, it has nothing to do with a certain blockbuster movie. I prefer to think of it as today, I decided to do some French cooking and prepare Boeuf Bourguigon. To prepare this recipe, I worked with a modified version of the Julia Child original recipe, which I used as a reference. I made a bunch of further changes, some of which made the dish better (in my humble opinion) and some of which made it easier to prepare. The recipe I am going to post may not be exactly the authentic Boeuf Bourguigon as approved by the French masters, but it is my version of the dish and one I am very happy to share with others. I think it is a reasonably authentic and classic Boeuf Bourguigon, and the recipe is one that is relatively straightforward to follow. 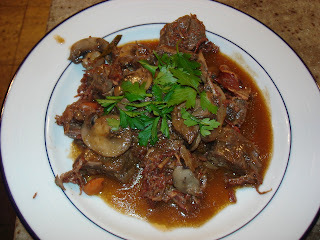 My goal was to rework a basic recipe for Boeuf Bourguignon that is almost as good as the original, but can be done in approximately 3-4 hours, rather than 8-10 hours. This is not to say there's not value in the original long-version, but simply that there's value and reasonableness for a more typical family with other things going on. So, keep reading below, if you want to learn how to make a delicious Sasha-classic Boeuf Bourguigon. First, prepare the beef fry bacon by sauteing in a dutch oven (Le Creuset!) in 1-2 T of canola oil. Cook until crispy, the same way you would prepare bacon. In a separate pan, saute the onion and carrots in olive oil, for about 10 minutes, until the onions are tender. Remove the bacon and keep the fat/oil from the bacon and use to sear the beef chunks lightly. Before searing the beef, coat with the 2 T of flour. I seared very lightly. Return the bacon to the Dutch Oven, and add the carrots and onions. Next, to the Dutch Oven, add the wine and the beef stock. You can add more or less beef stock, to get the right amount, but make sure the total amount of liquid covers the meat, just barely. I used store-bought organic beef stock, and that makes a delicious dish. You could, of course, prepare your own beef stock from scratch, but this takes hours, and I really didn't feel like spending the time today - although perhaps on another day when I had specifically allocated the entire day to the project. It still was very good tasting so I don't think I sacrificed too much here. Add the tomato paste, thyme, rosemary, garlic, bay leaves, salt and pepper. Bring to a boil and then put in the oven, preheated to 325 F. Cook for about 2 1/2 to 3 hours, until the beef is tender. Add the 2 T of butter and 2 T of canola oil and allow the butter to fully melt aat high heat. Cook the mushrooms about 5-8 minutes. When the mushrooms are just about done, add the 4 T of brandy and cook for another minute. To prepare the braised onions, dice the onions and heat the butter and oil in a skillet. Add the onions and saute for ten minutes over medium heat. Add the 1/2 cup of beef stock and simmer for 40-50 minutes. When the meat is tender, remove the Dutch Oven from your oven and empty its contents, collecting the sauce separately. Distribute the mushrooms and onions over the meat. Skim the fat off the sauce and simmer the sauce until reduced to 2 1/2 cups of a sauce thick enough to coat a spoon. If the sauce gets too thick, add a little bit more of the beef stock. Keep boiling if you need to to reduce the sauce to get it just right. I served the dish with the sauce, and seasoned with the parsley. I think I just made French cooking quite a bit easier, but still fun and tasty.